We proudly offer an array of Easter Egg to our valuable customers, at very reasonable prices. These items are fabricated using premium quality raw material and are designed by our team of industrial experts. This product range is well known in the market for its high durability and fine finish. Further, our clients can avail these products at market leading prices. 3" Easter eggs higly qualitative with the assorted designs. The wonderful Easter egg comes with a combination of yellow and maroon flowers on the green base. It doesn’t allow one’s eyes to blink. The beautiful shiny finish gives a soothing sense to eyes. You can use this master item in different festivals or as a decorative in your room. 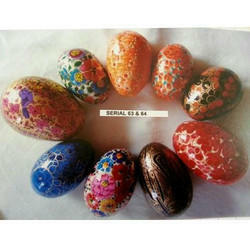 We are involved in providing high quality range of Paper Mache Easter Eggs. These are delicate decorative art, used as lovely Easter decoration or are filled with candy for a fun Easter egg hunt. These are offered in variety of designs, shapes and sizes. 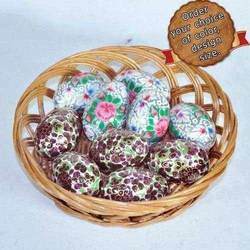 Paper mache eggs come in 3" and 2 "Size and available in Assorted range. Comes with Egg Stands on order basis. Just like there’s more than one way to skin a cat, there are some alternative ways to dye Easter eggs. You don’t have to spend a wad of bills on fancy prefab kits to create colorful contents for your bunny basket. Driven with precision, we have been readily affianced in offering Chocolate Easter Egg. we offer high quality easter eggs 35 cm ht. Plastic Egg is made of food grade virgin PP avaliable in assorted colors. Can be used for chocolate packing and confectionaery packing.